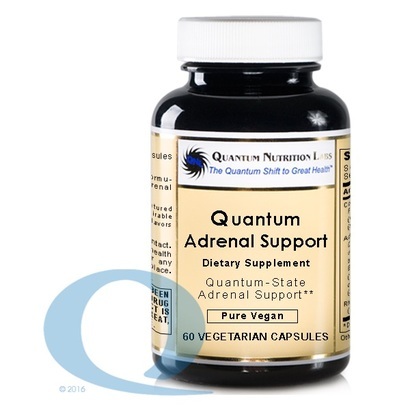 Quantum Adrenal Support is a quantum-state, nutraceutical formula designed to support healthy adrenal glands. This formula features Cordy Pro™ with Fermented Cordyceps (fermented mycelial extract) and Eleuthero root. This formula also showcases Rhodiola Rosea Extract and Adrenal Pro™ Support, a comprehensive, multi-nutrient support blend. Everyone may feel fatigue from time to time. In addition to adopting healthy lifestyle choices for the management of occasional stress, such as regular exercise, certain herbs such as Rhodiola Rosea may help with occasional fatigue and may support energy levels. Cordyceps sinensis is a famous adaptogenic mushroom that has been used for centuries for whole body support. The well known botanical, Eleuthero root (also called Siberian Ginseng), is added for optimal nutritional effect. Stabilized rice bran, vegetable cellulose capsule. Take 2 capsules at breakfast or before 2 P. M.
60 caps (Cordy-Pro 310 mg each , Adrenal Pro270 mg eacg).